Have you ever asked someone, "Can you edit my photo for me?" Well, now you don’t have to ask - you can mend it! 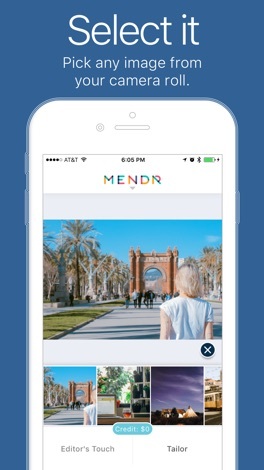 With Mendr, the power of professional photo editors lives in your pocket. We match your photo edit requests to certified experts who perfect your photos and send them back. Download today and never edit another photo again! It’s a photo editing app. Just upload your photos and our pros will edit them for you. Editing photos is overwhelming. Even if you use some crazy app that has all the face editing, photo enhancement, filters, background swapping, and retouching tools you can stuff into it…stop! Don't do all that work. What could be more convenient than our elite editors skillfully and efficiently delighting you with the outcome of each and every edit? No one wants to squint at the phone every time you need to edit a photo. You take pictures, offload your photo editing to our professional retouchers and image editors at affordable prices and we’ll make ‘em look good. – Select an image from your camera roll (well, technically you’ll need to open Mendr first). – Choose the type of edit and explain what you want. – Or save even more time by letting our editors make the decisions for you. We call that Editor’s Touch and it’s a feature you won’t find anywhere else. 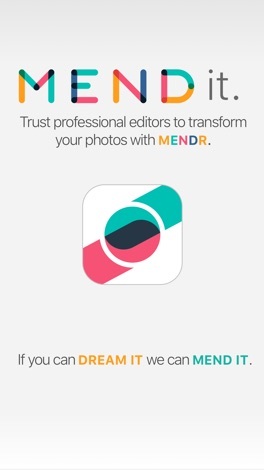 – Hit “MEND” and you’ll get a notice, usually within a few seconds, that one of our editors has started editing your photo...literally doing the work for you. 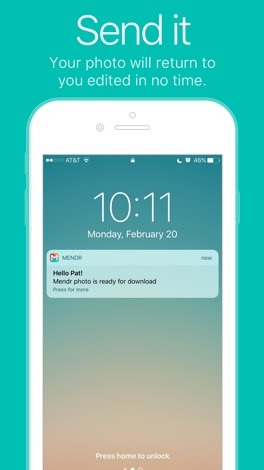 – We’ll send you a notification when your photo is ready to review and download. We handle all kinds of interesting tasks. 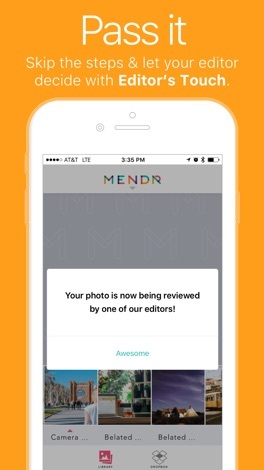 We have influencers using Mendr to edit the photos they post on social media platforms like Instagram. Our editors can help achieve a consistent look so an Instagram grid looks perfect. Simply provide our editors with a reference photo so they can keep your look consistent and voila! We have entrepreneurs using us to edit their product photography for selling on platforms like Etsy, Craigslist, Poshmark, and Ebay to improve their product shots. We do things like add drop shadows, adjust backgrounds, merge photos, and adjust contrast/color. We can even perform impressive mannequin removals. Our editors are amazing at removing objects/people like ex-boyfriends or photobombers, adding a friend from another picture, swapping out backgrounds…anything that can be done in Photoshop. Have fun combining photos, adding text, creating memes, changing hair or eye color, or removing flaws like washed out color or fly-away hairs. Just ask and we’ll tackle it for you! For all of the photographers out there, you know that taking high-quality images is of utmost importance. And the image editing and retouching process always comes next. With Mendr, you no longer have to spend countless hours in Photoshop, FaceTune, and Lightroom to achieve the perfect photo. Just send your photos to us and we will take care of that tedious work for you. Oh, and if you shoot on your DSLR you can use WiFi transfer to upload and offload your high-resolution images to Mendr for the highest quality retouching and editing. Very helpful for you travel photogs out there. 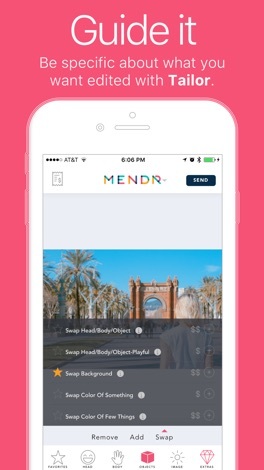 And to clear up the “How do you spell it?” question, it’s Mendr, not Mender. Hope that clears things up. Although if you’re here, you likely already knew that.